Hollywood has made a living ripping people’s faces right off their skull. By many accounts, Tom Cruise has positioned himself as a professional face ripper. Whether he’s ripping and flipping his face off in Vanilla Sky, or doing his best imitation of hiding behind different faces in Mission Impossible – Tom Cruise’s film earnings have proved that a face ripping strategy can be very profitable. Yet, the most famous face ripper is undoubtedly Hannibal Lecter. While his creepy movements, and his creepy speech was more than enough to give you the creeps, Lecter’s real power was revealed the moment he escaped using another (unfortunate) person’s face as a disguise. Whereas Tom Cruise enjoyed his face-ripping experience, Hannibal Lecter’s victim certainly did not. In both cases, the face-ripping actions proved to be both memorable and shocking. Unknown to Hollywood, and unknown to most investors – the world is on the precipice of one of the biggest face-ripping market movements to be felt by the money world. For many reasons, many people hate the USD. Debts, deficits, wars, Trump – you name it, the reasons for the USD to fall are too many to count. Yet, despite all the moaning and groaning about the USD – it just won’t go down. And in the investment world, what won’t go down – goes up. IceCap expects the USD to rally hard. The potential for a surge will be so aggressive that it will rip the face off all investors who are bearish against the USD and positioned for it to fall. This is the real risk that faces the market today. Well, we’ve been watching now for quite some time – and it still hasn’t happened. We’ve watched Canadian, British, Australian and even tolerated the big American ones too – yet most media outlet refuse, is prohibited, or simply doesn’t understand it enough to report to the masses the happenings within the world’s bond market. Yet, every single evening when the majority return home from their jobs, they inevitably turn to the TV to see what happened while they toiled away their day, earning money to tuck away for their eventual retirement. Sadly, the largest investment market on the planet rarely gets a mention, a like, or even a tweet. Readers of the IceCap Global Outlook are fully aware of our expectations for a crisis in the bond market. The crisis will likely originate, from a re-escalation of a crisis in the Euro-zone. Cracks have started. Chills are beginning to be felt down spines. And if you look close enough – you’ll soon see the days of the big banks, big media, and big consultants avoiding this big discussion are coming to an end. The entire concept that there is a real person behind the investment account number has somehow disappeared over the years. Instead, the investment industry has intensified its laser-like sharpness on miraculous products, lead by armies of glasses-wearing analysts scouring the world over in search of undiscovered opportunities. Those that cannot see through this charade, will easily rationalise 100’s of banks, 1000’s of mutual funds, and 10,000’s of analysts as something that’s really cool and worthwhile paying 2% or more a year to experience. Yet, others know that all these banks, mutual funds and analysts are all equipped with the same data, the same spreadsheets, the same software and the same bonus pool payout structure. Which should lead you to ask – how is it possible to do better than the average? The answer of course – it isn’t. Instead, the only way, and the easiest way, to truly protect your hard earned savings, grow your retirement funds, and ignore the headline news is actually rather simple. Do the opposite of what everyone else is doing. Being a contrarian in the investment world certainly isn’t a new and novel idea. Yet, it’s incredibly difficult to do for several reasons. To start with – being a contrarian, means you will take active decisions within your investment portfolio which are quite different than what everyone else is doing. Of course, being a contrarian doesn’t mean you should be stupid either. It just means you need to be mindful of the truths, the untruths, and most importantly – be aware of your surroundings. Achieving this starts with a rather novel concept – ignore the masses. And there’s no better way to ignore the masses, then to ignore the headline news regarding the stock market. If the first four months of 2018 did anything to investors, it made them a little bit more honest with themselves. In many ways, the volatility waves and the losses generated were unbearable for most. For many, the first real losses in over a year can be hard to stomach. And despite acknowledging that stock markets can go down as well as up – the majority of investors react quite differently when this guaranteed event occurs. By now, everyone should agree that all the euphoria experienced from gains, is dwarfed by the pain experienced from losses. In other words, the emotions earned from both gains and losses are not symmetrical. Those that disagree, haven’t truly experienced a loss. Which of course brings us to the current stock market correction. As of writing, US stock markets are now flat for the year 2018. Yet, you would never know it from the headlines of the big media outlets, or worse still – the twitter feeds from those who have been calling for stocks to crash to zero. In many ways, one can be forgiven for falling for the hysteria. Between trade wars, tax wars, and real wars – everyone will admit that perhaps the world is just a bit off kilter. Yet, if one stepped way back and objectively assessed the entire situation – one would discover this trifecta of events has not materialized into the face-ripping market movements that sells papers and clicks. Granted, the world IS in a precarious state – IceCap has been writing and speaking about this in detail. But the challenge for investors remains – the majority continue to incorrectly assess the situation and therefore remain incorrect with their market expectations. In other words – the majority are once again proving to be wrong. IceCap’s primary model for determining whether the stock market is about to turn into an abysmal collapse – has NOT flashed red. Yes, the model signals have weakened over the last few months, but as of writing there isn’t anything happening to suggest we should begin to stock up on bottled water, duct tape and (heaven forbid) 10-year US Treasuries. From a technical perspective, our model tracks trend and momentum rate of change indicators covering sector/industry/sub-industry levels for multi-cap weighted indices. There are jokes. There are riddles. There are conundrums. And there is the Euro-zone. Sometimes when writing the IceCap Global Outlook, finding new investment themes can be tricky – but thankfully we have the Euro-zone, the European Union and everything else in between. It’s absolutely beyond us how anyone on planet Earth can say with a straight face that Europe is fixed and there is no risk of the European banking system and sovereign debt market imploding. The negative effects on the bond market WILL spread around the world. Yes, these are dire warnings. But the good news is that from a financial perspective, there are many ways to both protect your hard earned savings and even profit/grow your investment portfolios. Of course, those in Brussels and Frankfurt will tell you a completely different tale. Their stories begin with once upon a time, and weaves and bobs the readers to sleep with thoughts of financial integration and stability, safety and soundness of the banking system, and consistent supervision. The European Central Bank and European Union websites are stuffed with beautiful and harmonious literary masterpieces. Yet, as soon as you take your head out of the sand and objectively look around, you’re hit with head shaking facts, figures and turns. One of the worst kept secrets amongst those who care to look, is that the European banking system is absolutely stuffed to the gills with bad loans that banks absolutely refuse to write-off. This is especially true in Italy, and the reason the banks have not written off these band loans is due to the need to replace these losses with new investment capital. Nearly 10 years ago, the Americans faced the exact same dilemma and their imperfect solution was for the US Treasury to directly invest in the banks by way of the TARP bailout. For better or worse, the Americans wrote-off (most) of the losses and forced the banking system to recapitalize. In Europe, instead of writing off the bad loans and recapitalizing the banking system, they instead used the International Monetary Fund, World Bank, European Investment Bank, European Bank for Reconstruction and Development, Bilateral Loans, Loan Facilities, European Financial Stability Mechanism, European Financial Stability Facility, European Stability Mechanism, Longer Term Refinancing Operations I, Longer Term Refinancing Operations II, Zero Interest Rate Monetary Policies, Negative Interest Rate Monetary Policies and Quantitative Easing Monetary Policies to save the day. The list is long. It’s exhausting. And the only people who gauge these programs as a success are those in Brussels, Frankfurt and other centers of government who have all profited in one way or another. Yes, this critique is harsh – and very un-European (or un-Canadian for that matter), but the truth sometimes hurts. And the truth is, the ECB has tried extremely hard to right the ship. Yet, in addition to plain wrong and disastrous policies (ZIRP, NIRP, QE), other attempts to fix things have been completely rejected by various forms of governments. The latest one of course is the ECB’s plan for banks to write-off bad loans and raise new capital. When first announced, this was the newest plan to finally end the banking and debt crisis in Europe. Months later, the plan is completely dead on arrival due to the rejections by the banks themselves. European banks will tell you that there is no way possible for them to either write-off the loans, set aside capital to protect new loans, or attract new equity/regulatory capital from private investors. Over the last year, stocks of the biggest European banks have all declined significantly with the biggest, Deutsche Bank, having declined over -30%. The problem with Europe is that the doom loop exists and there is no way to break it. This doom loop involves the European Central Bank (ECB), the Italian Government, and Italian Banks. The ECB prints money and sends it directly to the Italian Central Bank. The Italian Government borrows money by selling bonds to Italian Banks. To complete the loop, the Italian Central Bank buys these bonds from Italian Banks. Wash, rinse, repeat. This same exercise exists for all Euro-zone countries including France, Spain, and even Germany. It’s become a doom loop because in order to break the loop, private investors will have to step in to fill the gaps. And private investors have a rather novel idea when it comes to investing – they either avoid risk, or of they do make a risky investment, they want to be paid appropriately for taking on this risk. 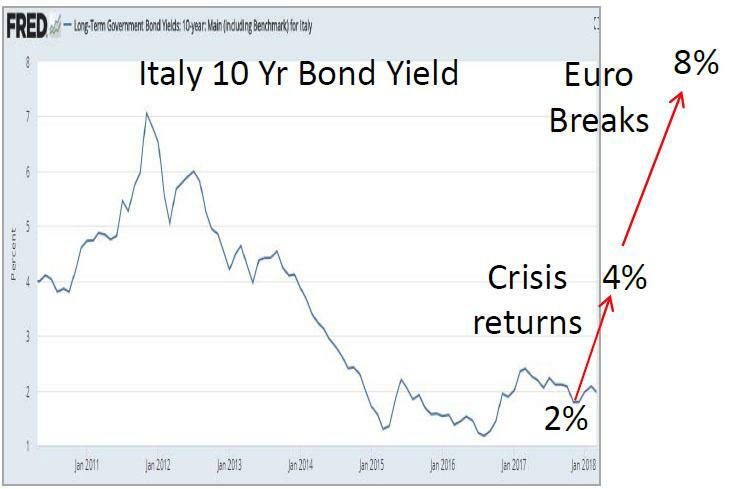 And with bond yields across the entire Euro-zone at all-time lows only because of the doom loop – why on earth would any rational private investor risk money by lending to Euro-zone sovereign states, or investing in Euro-zone banks? For those still in disbelief, spend some time with the chart below. 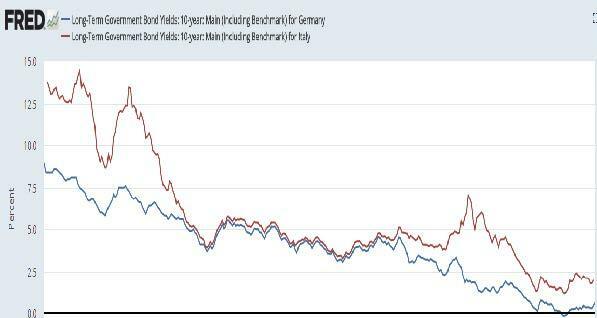 There you will see how interest rates in Italy and Germany converged entering the creation of the Euro-zone. Then how they become locked together, and now how they are moving away from each other. 2) All countries must agree to forfeit complete control over government finances of spending and taxation to Germany. And considering not one, let alone both of the above will never occur – the default option is for the crisis to return. Putting this all together, one should be able to understand our expectation for many bond strategies/funds to perform poorly, and of equal importance – the USD to soak up foreign capital seeking safety from the bond market crisis and the resulting currency crisis. Remember – all bond markets are connected. The crisis in Europe will not be isolated to Europe.